Outlook includes several ways to automatically manage different tasks. This article explains how to control your signatures. You can have a different signature for different email accounts, as well as different signatures for both new messages and replies/forwards. These topics are covered in our Outlook advanced class. To manage a signature, use the following procedure. In a new message, select Signatures from the Message tab on the Ribbon. (You can also access Signatures from the Mail tab on the Outlook Options dialog box). 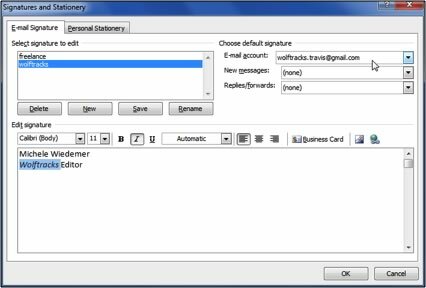 Select Signatures to open the Signatures and Stationery dialog box. In the Signatures and Stationery dialog box, select the signature that you want to edit. You can select Rename to change the signature name. In the Rename Signature dialog box, type, and new name and select OK.
Also see what is Microsoft Outlook? You can select Delete to remove the signature. Outlook displays a warning message. Select Yes to continue. If you have multiple email accounts, select the email account for which you want to add an automatic signature. Select the signature that you want to use on new messages from the New message drop down list. Select the signature that you want to use on reply to or forwarded messages from the Replies/Forwards drop down list.